Farmers Insurance continues its Hall of Claims ad campaign with a new spot, revealing another unbelievable but true claim that Farmers has covered. The 30-second spot, titled “Sandtrap Scavengers,” recreates a situation that took place on September 29, 2017, when a father taking his daughter to her golf practice asks her some questions in the parking lot. Behind him, a bunch of turkey vultures (which the girl didn’t know how to call but “big birdie”) landed on his car. 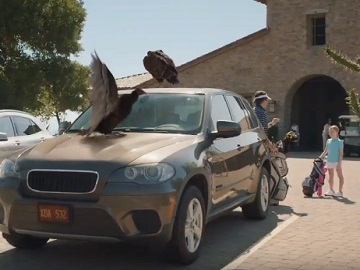 Luckily, professional golfer Rickie Fowler passes by and lets him know about the birds that damage the car. The commercial ends with Prof. Burke – played by Academy Award-winning actor J.K Simmons – telling a customer, while looking at a robotized version of a turkey vulture near a car, in the Hall of Claims, “Otherwise known as Sand Trap Scavengers. Seen it, covered it. September 29, 2017. Talk to Farmers. We know a thing or two because we’ve seen a thing or two”. Launched in 2016, the “Hall of Claims” campaign has featured, so far, many other “real-life bizarre insurance claims,” from household accidents to unexpected run-ins with animals to car crashes, that the insurance company dealt with. The insurance company has even created an interactive website called “Hall of Claims,” based on real insurance claims compiled by Farmers’ network of agents and its claims professionals.